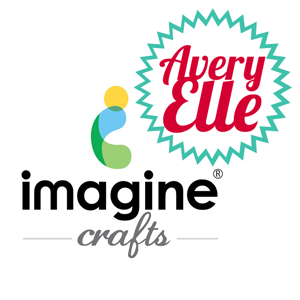 Today is a fun day because Imagine Crafts / Tsukineko & Avery Elle have paired up for a blog hop! There are going to be a lot of amazing projects on the hop today showing how well Avery Elle and Imagine Crafts / Tsukineko products work together. We also have a fun giveaway, so be sure to visit all of the blogs participating. Here's the list of all the fantastic folks hopping today! JJ Bolton - you're here! For my hop cards, I used the new Avery Elle release Ikat Additions. Jamie has given us some really cool new ikat images that you can use with the original set or alone. 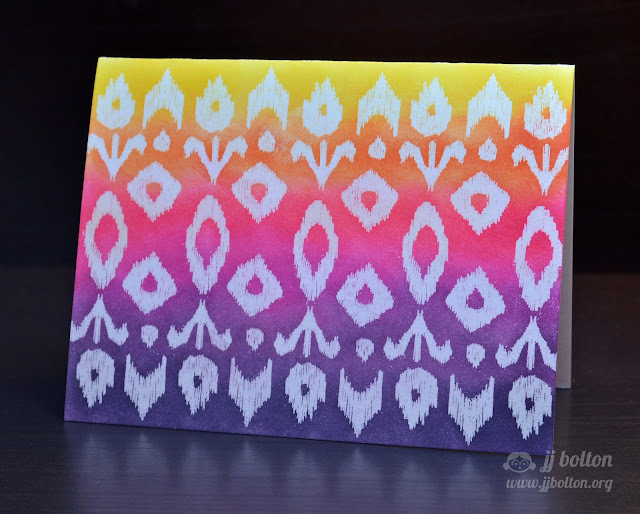 With these ikat stamps it is so easy to create your own custom background which is exactly what I did with this card! First, I stamped my design with Versamark ink (watermark ink) and heat embossed it in clear. I have to say that Versamark is one of my favorite Tsukineko supplies! I don't think I've gone a week without using it. After heat embossing, I gathered up a handful of colorful Memento inks. To be exact, I used Dandelion, Morocco, Rose Bud, Lilac Posies, Sweet Plum, and Elderberry. I used my handy dandy sponge daubers (can never have too many of these things) to blend the ink over embossed design. Don't you just love how rich the color turned out? I didn't have the heart to stamp a sentiment over the design, so the card has no sentiment:) The next card I made has a slightly different look but just as colorful! As you can see, this card uses only one ikat stamp, the chevron. 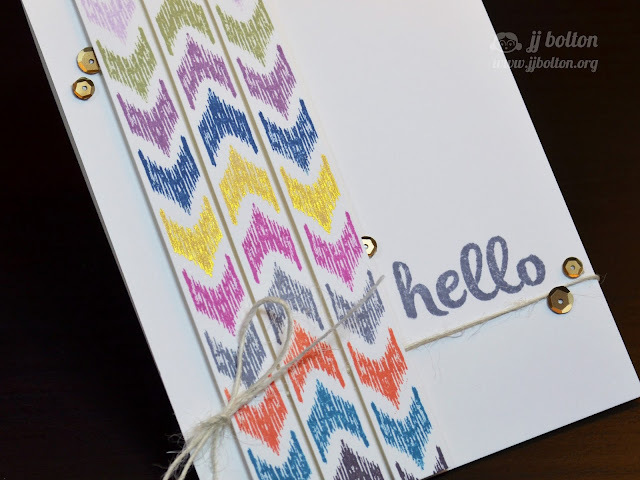 I stamped chevrons in multiple colors and then cut out three strips. The strips are attached with a bit of foam tape so that I could feed the twine behind them. For this card, I used a bunch of the yummy new Memento colors including Morocco, Teal Zeal, Gray Flannel, Lulu Lavender, Expresso Truffle, Nautical Blue, and Pistachio. I even slipped in a bit of gold in the chevrons (who me?) with some Delicata Golden Glitz ink. The "hello" sentiment if from the new set Modern Leaves. That's it for me today and now it is time for our giveaway! Leave a comment below and/or on any of the posts in the hop to be entered to win. There is no purchase necessary and you must be 18 years of age or older to enter. This giveaway is void where prohibited. We will be selecting two random winners. One will win a $50 Avery Elle gift certificate and the other will win $50 worth of Imagine Crafts/Tsukineko product! You have until midnight PST, June 14th to comment for a chance to win! The winner will be announced on the Avery Elle blog on Monday, June 17th. Really great cards. Love the look and the colors. These cards are SOOOOOOOO AWESOME, girl!! You ROCK.....just sayin'!! your first card blew me away! LOVE it! Gorgeous cards, JJ! Love them! Love all the colour on these cards, especially the first one! OMG! Love the colors on both! Way to rock the stamps and the ink...awesome! Loving all the colors!!! TFS!!! Thanks for the Ikat use inspirations. I like the bright colors in the first card. And that gold touch on the second card is awesome. I love the gold shine I can see in the last photo. I love this set and your cards are beautiful! Awesome resist technique with the VersaMark! And I'm totally diggin' the Delicata accents in the Chevron pattern. Both gorgeous! Love your blending of inks on that first card and how you placed your colors on the second. 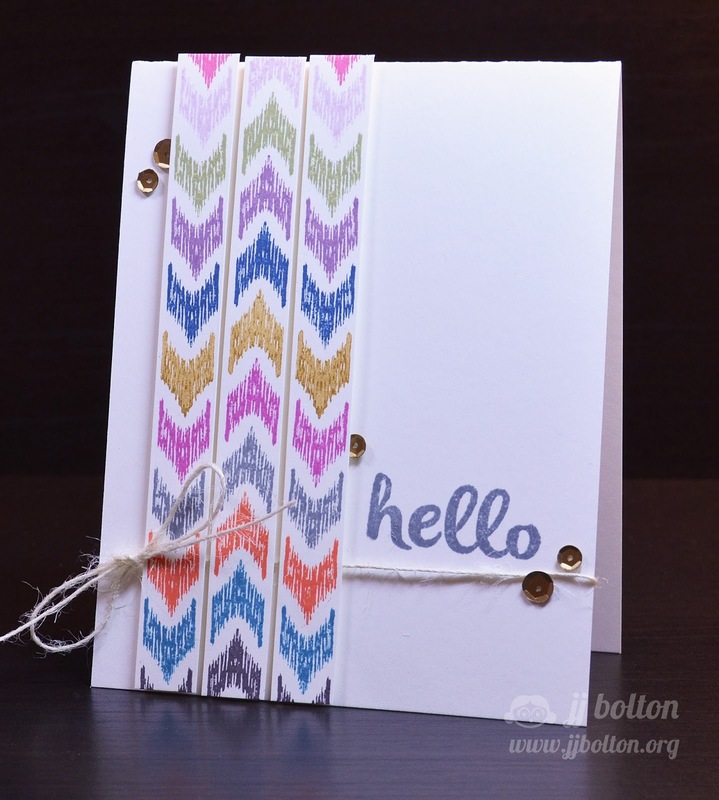 Both cards are beautiful - love the chevron pattern and your color choices! You have made some incredible cards with these unique stamps! Your ink distressed card is brilliant! And I noticed the gold chevron right away. Isn't that Delicata so yummy? Stunning and brilliant as always! Your color combinations are always so perfect. Just beautiful!! Love your color combos on both cards!! Both cards are fantastic. I love the different colors of Mementos inks mixed with the ikat images. Fabulous! Those are really great cards! Both beautiful cards, I love the chevron card so much! Gorgeous Ikat designs on both...the first one is breath taking. These are both so pretty! I really love the second one! SIGH* LOVE LOVE LOVE LOVE LOVE the first card the most but all three are gorgeous! I love your color combinations. They are very refreshing! TFS! Absolutely gorgeous stamping, JJ! I love that you left the sentiment off the first card...your pattern is so colorful and just perfect by itself! Great idea to use the panels on your 2nd card...the colors are just so striking! Thanks so much for sharing your inspiration with us! Gorgeous! Loving all the colors and use of inks, JJ! Way to rock the blog hop! Gorgeous! Love the bright colors on the first one and the fun touch of gold on card #2! Such original concepts in your card designs! Way to rock these stamp sets and show off lots of ink! LOVE THESE! Especially that first one, the embossing/blending is fantastic, I love the dark colors! First time visiting ur blog. And im glad found ur blog through bloghop. Your creations are amazing! Gorgeous, JJ! first card looks so rich with the colors and the ikat pattern. I love how you mixed it up with the second card. You, gold? Never. ;) You rock! Both cards are awesome. Love the colors. All fabulous cards, love the colors!! Gold? Who woulda thunk it? 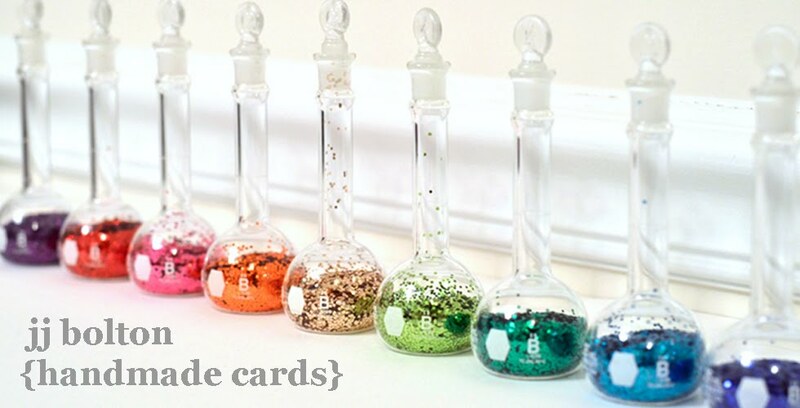 ;) Just the perfect amount of shimmer on the second card - love the sprinkle of sequins! And the first card - SUCH rich colour saturation! Your ikat stripes are fantastic ! These are seriously cool cards! Your gradient color card is AMAZING. Thank you so much for sharing it. I love the ikat pattern on it too! So pretty! The way you got the colors in the first card to blend is amazing! love your colors on both of these! Great colors and card layouts! Love the gorgeous colours, especially in the first card. ....love the ombre cards...well done. oh.. These are great... I love those colors. Well done. JJ - Just love both of your cards. The colors are fabulous. Also thanks for the chance to win! Both cards are gorgeous. The first one is just WOW!!! That first one is just stunning!!! The first card is just stunning! Loooove the bright colors on white resist. Gorgeous!